Around My French Table, Dorie Greenspan’s French Cooking book, has shown me that the French takes food from other cultures and makes them their own too. So far we had made Vietnamese noodle soup, gnocchi French-style, and now B’stilla (or Pastilla), a Moroccan pie. 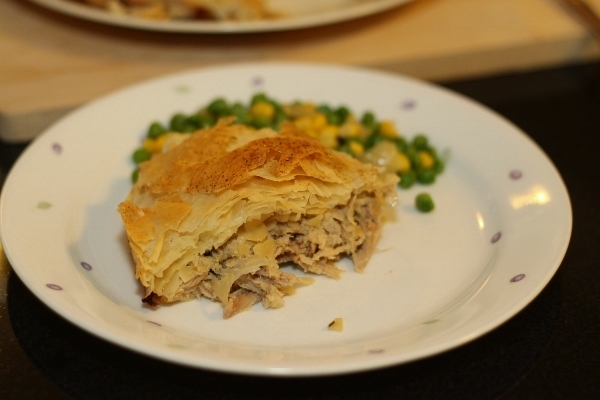 Chicken B’stilla is like a chicken pie but instead of using pie pastry to cover the filling, we use flaky phyllo pastry. 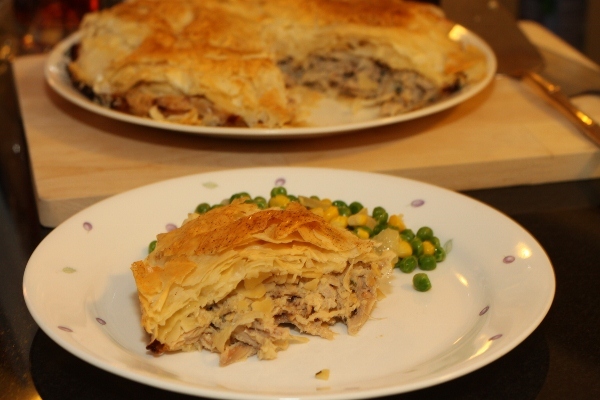 The chicken filling is spiced, sweet and savoury. In this version, the chicken is marinated in onions, garlic, ground ginger, ground coriander, ground cinnamon and saffron before simmering in chicken broth till it’s tender. A thick sauce is made with the strained broth and eggs, flavoured with lemon and honey. The chicken is then shredded and mixed with the sauce. I let my chicken filling sit overnight in the refrigerator because I didn’t have enough time to complete the dish that day. I wanted lots of time to work with the phyllo pastry as I’ve heard how tricky it can get and it’s also my first time with it! I bought Irresistibles phyllo pastry, which comes in long, rectangular sheets, thawed them in the refrigerator for more than 24 hours and trimmed them to the 9 x 14 inches required for this recipe. I wanted to skimp on the parchment paper so I didn’t separate the phyllo pastry but left them stacked as they are. They separate and lifted off easily after brushing with butter and only tore because I brushed too hard. Laying 4 sheets down on the pan and folding them over the filling was manageable but I couldn’t tucked the top sheets in neatly. They ended up pressed down but with the ends sticking up. I baked the b’stilla as directed and the pastry turned golden brown but cracked all over! Could anyone tell me why that happened? Turning the b’stilla out onto the cutting board before inverting it made it a little worse. Putting the cracked pastry aside, the dish was a hit! I love the sweet and savoury filling as did my husband. Our children liked it too but they both seem to love the thin, flaky pastry more! I served it for dinner with a last-minute put together side of frozen peas and corn cooked with onion, chicken broth and a little cream. I will make this again seeing I have half a box of phyllo pastry leftover and the filling is delicious. Hope the pastry will turn out better next time. The only thing I don’t like about making this is the lingering sweet smell of simmered onions, cinnamon and saffron. By the second day I had to open the windows even though it’s below freezing outside to air the house! Click here to look at the b’stilla other French Fridays with Dorie members made. After 4 winters here, I’ve finally got the time to look into ice-skating. I had wanted to do it last year as I live in a ‘hockey town’ with 2 skating arenas. Big Kid’s school takes them skating for a couple o f weeks every winter as part of their physical education programme too. We bought him skates and a helmet and even took him for lessons so he would know how to skate. As I watched him and his schoolmates skate last year, I thought it would be fun but I couldn’t find a right pair of skates. This year I found a comfortable pair that fits well and one that wasn’t too expensive. One of the skating arenas offers free adult skating every Thursdays from 1pm to 2pm which is perfect as both boys are in school that time. 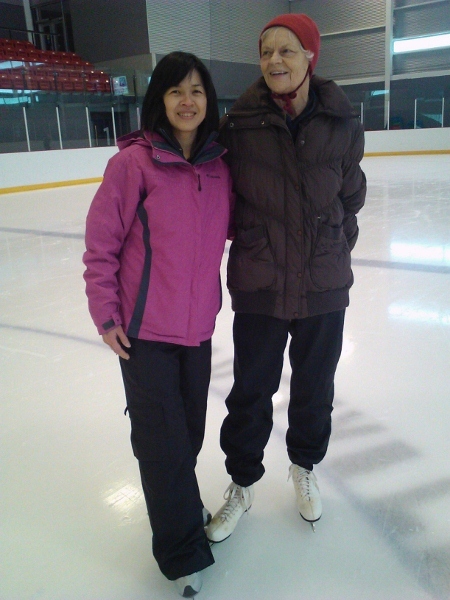 Together with my friend, Maria, who has always been asking me to skate, I went last week feeling nervous and excited. I had my snow pants on thinking I’m going to fall and it will shield my pants from being wet. I also put on my waterproof gloves. 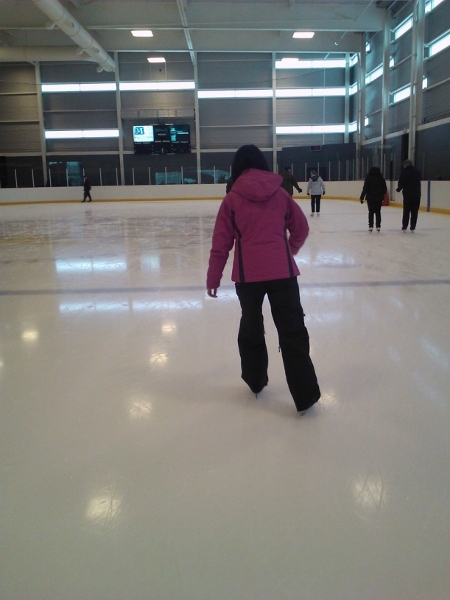 When I got to the rink, there were about 10 adults there already, all seniors, and they were whizzing around the rink fast! I got hold of a learning frame, which the little kids use when they’re learning how to skate, and got on the ice with it with my thickest face. Maria kept telling the seniors who were around us, “She’s new.” As if it wasn’t obvious! A lady, Connie, whom Maria knows skated over and Maria asked if she has any pointers for me. “Lose the frame,” she said, “you’re not going to learn how to skate with it.” So I listened to her and attempted to skate. Amazingly, Surprisingly, I found it easy to hold my balance. Before long I was skating! Connie (pictured on left) was su rprised and asked if it was really my first time on the ice. When I told her it was she asked if I used to play sports. Well, yeah, but only because it was compulsory in high school to play a sport. I attribute my ability to skate on the first try to my experience on roller skates when I was young. We didn’t skate a lot but I remember going to the roller skating park some times with my sisters. Thanks, Dad, for bringing us there and for the roller skates! I was hesitating about posting this week’s French Fridays with Dorie (FFWD) recipe because it didn’t turn out well for me. 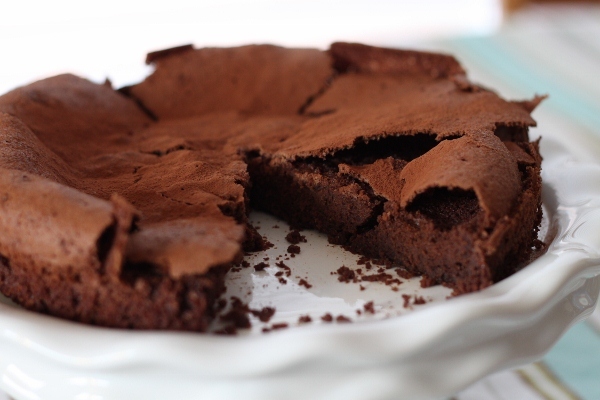 It tasted great, the double chocolate mousse cake – chocolatey and luscious – but didn’t look so pretty. The top lifted up and cracked. I’m not sure what caused that to happen but I know I had over beaten the egg whites. It broke up into lumps when I folded it into the chocolate batter. 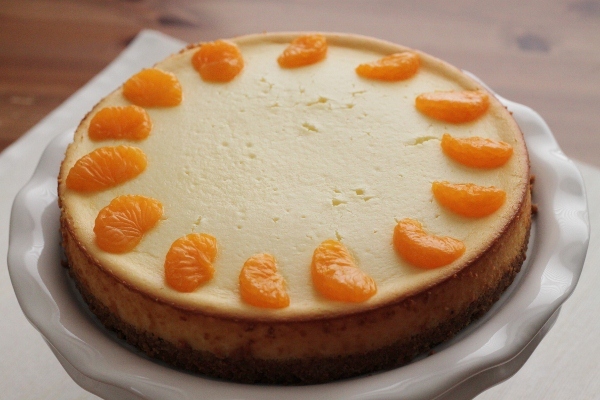 This mousse cake was made in four stages. First, one third of the mousse was baked as the base and chilled. Second, the remainder of the mousse mixture is scraped over the base and chilled again. The cake can be served at this stage after refrigeration. Third, the cake is baked again until the top is puffed. The cake can also be served at this stage. Fourth, the cake is cooled to room temperature after baking and chilled again. Dorie said each layer has a different texture but I really couldn’t taste it. 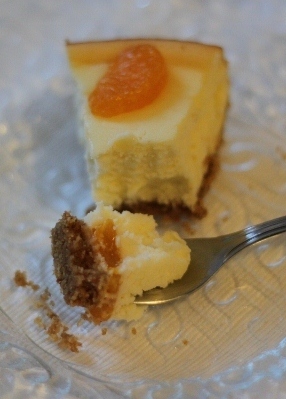 I could only taste two textures – the thin, soft layer that has lifted off the cake, and the soft and velvety mousse base. This cake deserves a second try but I didn’t have the time this week to do it. I’m also afraid of failing again! Anyway, have a look at the successful versions of this cake baked by other FFWD members here. It’s called Gnocchi a la Parisienne, where the gnocchi (the dumplings) are made of choux pastry unlike the Italian style which is commonly made of potatoes and flour. The dumplings are light and soft so much so you don’t feel that you’ve eaten much even after finishing a big plate of this. I followed Tante Leo’s style from the recipe and beat one egg white separately before folding into the dough. The dough was scooped out using a teaspoon and it took about half an hour for me to cook the entire batch. For the cheese topping, I used a combination of Gruyère and old Cheddar for more colour and flavour. I’m not sure if the Béchamel sauce is supposed to turn out smooth and easy to pour but mine didn’t. It was thick and slightly lumpy but I was able to spread a layer on the bottom of the pan and also spread the rest of it over the gnocchi. 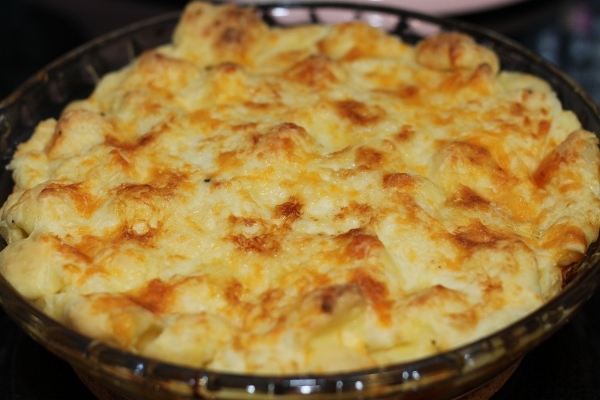 If not for Dorie making a comparison to macaroni and cheese, I wouldn’t have any idea how this dish would taste like as I’ve never had gnocchi before. It is like a pasta and cheese dish except the ‘pasta’ here is soft, boiled cream puffs. I love the cheesy crust on top but I do feel this dish would be even better with some bacon in it. 😉 I saved some for my Italian neighbour and she enjoyed it too. Making gnocchi is another first for me, I love this cooking club for making me giving me the opportunity to cook new types of food! French Fridays with Dorie is back to its usual format of every member cooking the same dish each week. 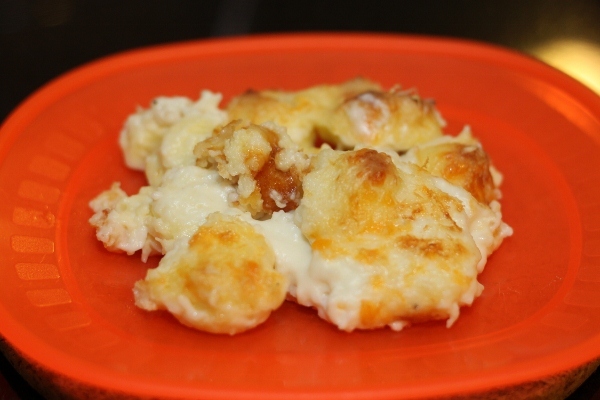 Click here to look at the Gnocchi a ala Parisienne other members made. This is another of my favourite Japanese home cooking dish. 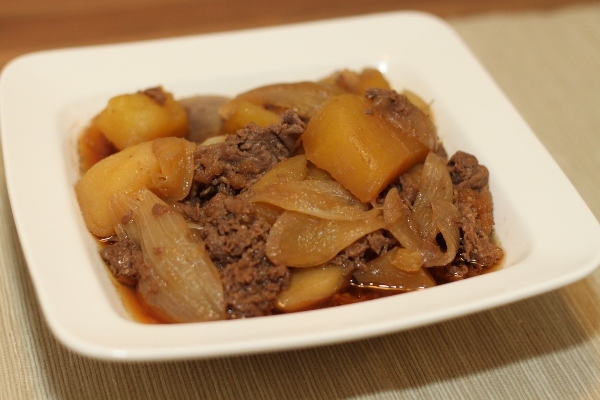 Nikujaga – tender beef with chunky onions and potatoes in a slightly sweet and salty broth. Thinly sliced beef is normally used but I used rolled sliced beef meant for shabu-shabu (hot pot) instead, which doesn’t require additional chopping. The beef cooks really fast so you simmer the dish just until the potatoes are soft to your liking. I had ran out of mirin so I added extra sugar and wine. 1 lb thinly sliced beef, chopped into bite-size pieces. 1. Wash and peel the potatoes. Chop each into 6 – 8 large chunks. Soak the chunks in water for 5 minutes to remove excess starch then drain. 2. Cut each onion in 6 wedges. 3. Heat the oil in a large skillet and stir-fry the potatoes for a few minutes. Add the onions and beef and cook till the beef is no longer pink. 4. Add the dashi stock, sugar, mirin, soy sauce and sake to the skillet and bring to a boil before lowering the heat to a simmer. Skim the surface to remove any scum that floats up. Cover and simmer until the potatoes are cooked, 15 to 20 minutes. 5. Add extra soy sauce and sugar, if desired, before serving. Because this dish is salty, it goes well with steamed white rice. Mushroom soup, another first for me (in terms of cooking)! 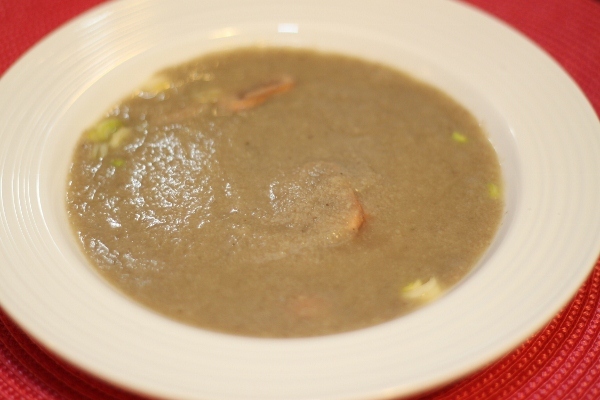 This Paris Mushroom Soup is simple to make and uses easily available and inexpensive white button mushrooms. I halved the recipe and it was just right for my family. I also omitted the dry white wine (1/2 of 1/3 = too little to bother with, and I don’t have any), sub the parsley with thyme (because I didn’t have any too) and used Pacific organic chicken broth. The soup was tasty although the texture was a little rough. Dorie had forewarned that if we use an immersion blender we will probably not get a super-smooth soup. You’re right there, Dorie! I couldn’t use the turbo speed because the soup will spit out so I used a medium speed and stopped when all the mushrooms were pureed and the soup was thick. Then the fun part, the mushroom salad. 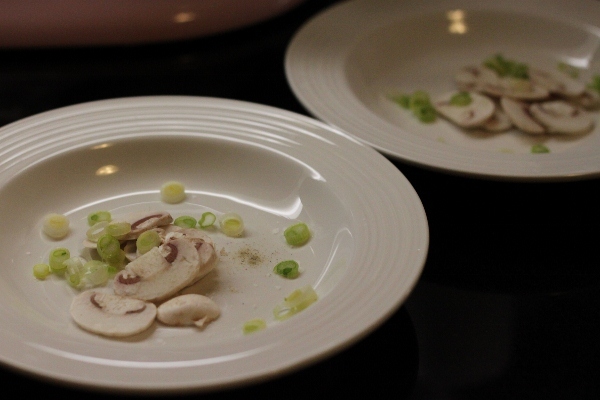 We were to put uncooked mushroom with some herbs and salt and pepper in the soup plates before ladling the hot soup over. I was apprehensive at first because I was afraid half-cooked mushrooms wouldn’t taste good so I sliced the mushrooms really thin, although I think the recipe meant for the mushrooms to be left whole. I didn’t have chives too but only green onions so that was the only green. The mushrooms cooked surprisingly fast and they were pretty good. You can tell I don’t eat raw mushrooms, right? My husband thought the soup was good but tasted Asian with the chopped green onions! 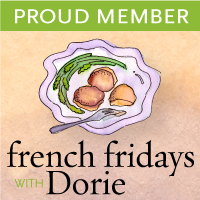 French Fridays with Dorie is back to its usual format of every member cooking the same dish each week. 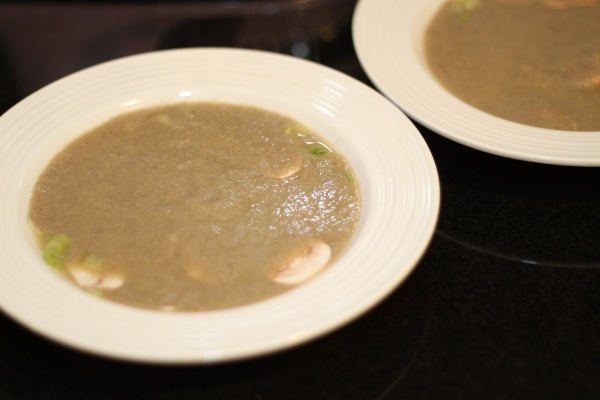 Click here to look at the Paris Mushroom Soup other members made.